Nev was everything I wasn't; out going, popular, cool and the girls loved him. He was my muse and the most famous unfamous person I have ever known, everyone loved him. He never minded being in front of the camera he was bit of poser as all skinheads are. Back then it was all about the dress up, whether he was a skinhead or a raver he always looked the part and that's kind what made him such a good subject, although I never thought about that at the time, I had to get to my 40's before I realised this. 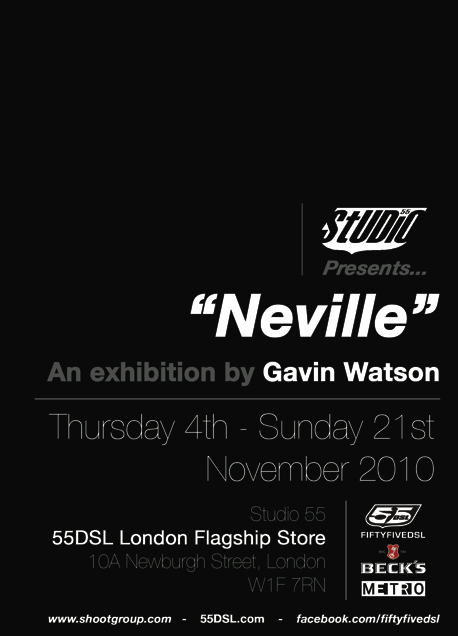 There came a point though for the sake of our relationship, where we both needed some time out to go and do our own thing which is what we did, although Nev continued to be a huge influence in my life - that's what this exhibition 'Neville' is all about and I really hope that comes across. Alcune foto conosciute e alcuni inediti per questa mostra curata dallo stesso Watson, che includerà i soliti soggetti di quegli anni 80 in bianco e nero, dai familiari ai gruppi del tempo. Una mostra che si aggiunge ad altri progetti che il fotografo sta portando avanti. A quanto pare, infatti, il fotografo sta lavorando a un nuovo libro, questa volta incentrato sulle sue fotografie di musicisti della metà degli anni 80 (da Morrissey ai Madness), che ha intenzione anche di promuovere con delle mostre in giro per l'Europa. Mentre aspetto, oltretutto impossibilitata ad andare a vedere questa mostra (se passate per Londra prima del 21 novembre, almeno voi, passateci), segnalo il blog di Gavin, già presente tra i miei links, aggiornato quasi giornalmente con foto di oggi e di ieri, di gente trovata per la strada e di cantanti e musicisti famosi, sempre nel suo inconfondibile stile 'candid' ma mai sciatto.